The plant with the round spikey balls is Eryngium Yuccifolium with the common name of Rattlesnake Master. This plant is in the carrot family. 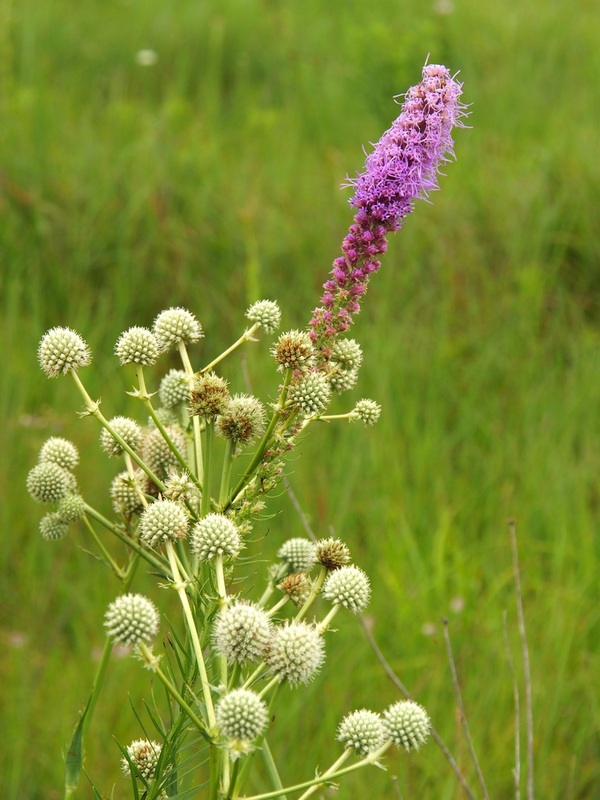 It is called Rattlesnake Master because the pioneers believed that the root could be an antidote to rattlesnake bites. 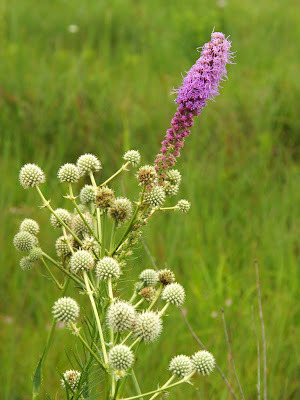 Rattlesnake Master is such an interesting name, and fascinating that the pioneers thought it was an antidote. The purple flower is lovely. We have some here that look similar. Perhaps they are of the same family. Anyway, I like the stunning purple flower. what a beautiful, interesting flower. Great information on two flowers I have only discovered recently. Thanks Misty! I love your photo. Victim" instead. I like the plant, regardless..they look nice growing together. I haven't seen many rattlesnakes, though we do have them in my native Georgia. I forget where but there used to be a rattlesnake roundup every year. interesting names, especially the Rattlesnake Master. terrific shot. Prairie Blazing Star—an appropriate name. I wonder if the Rattlesnake Master actually cured rattlesnake bites. Lovely shot!